The Citadel Museum preserves, interprets, and makes available for research use, historic materials pertaining to The Citadel as an institution. LT Peter Franklin Cureton "Unfinished Dreams"
The Citadel Museum is open during library hours, Monday-Friday from 7:30am to 5:00pm, Saturday from 9:00am to 3:00pm, and Sunday from 12:00-5:00pm. Upcoming closures are: Saturday January 5th, Sunday January 6th, and Monday January 21st. If you have any questions about the museum or potential donations, please email archives@citadel.edu. Visitors are allowed to park on the Avenue of Remembrance located directly in front of the Library. If parking there is full, Public Safety can direct you to another appropriate parking spot. The Mission of The Citadel Museum is to preserve, interpret, and make available for research use, historic material pertaining to The Citadel as an institution. The Citadel Museum represents the history of The Military College of South Carolina from its founding in 1842 to the present. Our exhibits explore the long history of The Citadel by showcasing some of our past and present uniforms displayed along a timeline. 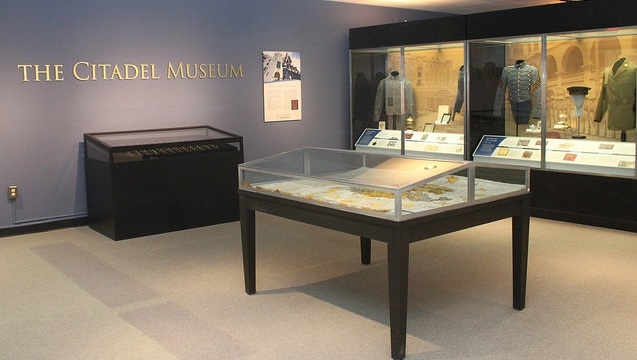 A display of Citadel rings from 1895 to the present is also a focal point of the Museum. Through a self guided tour on the Daniel Library's third floor, the visitor experiences the essence of each era in The Citadel's history. Be sure to visit our Cadet Museum Club exhibits on the library's first and second floors. These exhibits feature cadet life and alumni achievements. Citadel students interested in history are encouraged to join our Museum Club! We meet at least once a month during the school year, and leadership opportunities are available for upperclassmen/women. Museum Club members have opportunities to participate in special events, create historical exhibits, assist with research projects, and help to create new digital collections for our website. In the past, the Museum Club has gone on field trips to local museums, and has invited local archivists and museum curators to speak with members about careers in history. To join the Museum Club, email archives@citadel.edu and ask to be added to our email list. 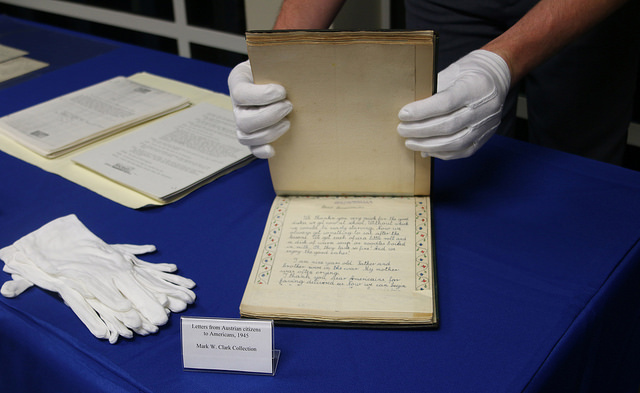 For those Citadel students interested in learning more about the management of archives and museums, we have internship opportunities available with The Citadel’s Archivist for academic credit. For more information, email archives@citadel.edu.